Say you’re on location at a photo shoot, or you’re on the show floor, and suddenly there’s a costume malfunction. A strap might break, a bit of armor snap off, or an enthusiastic fan might glomp you a little too hard and accidentally something. We’ve experienced it all before, and that’s why it pays to pack a convention kit bag. What’s a convention kit bag? It’s a stash of tools for con emergencies, and a great help when you need to jury rig your props and costumes at a con. With these tools at your disposal, you’ll also be able to craft on the go, so that’s kinda handy, right? We usually pack a pair of craft scissors and a craft knife. They’re useful for practically any situation, from cutting tape and string to bits of material you might use for patching up all that battle damage. Remember how MacGyver used to save the day with duct tape? Duct tape’s certainly saved ours on more than one occasion too. 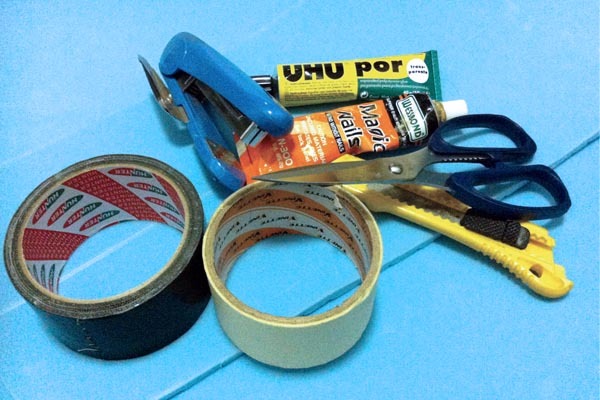 That’s why we keep a roll of it in our kit bag, together with a roll of double-sided tape and masking tape. Tape’s great for on the spot repairs, especially if you need to secure two pieces of armor or broken straps together. You can use it on cloth too, just as long as you paste it on the inside! We usually carry a tube of UHU POR and Magic Nails for fixing prop damage. The’re both foam safe, so they’re great for items you might have crafted out of compressed or expanding foam. We also keep a bit of contact glue on hand for armor repairs. Bits of blue foam coming lose due to wear and tear? That’s when contact glue comes in. It’s also a general purpose adhesive that bonds most prop and armor making materials. You’ll want to keep liquid adhesives wrapped up and tightly sealed in a Ziploc bag though. You don’t want any spills, that’s for sure. Cloth costumes also see their fair share of wardrobe malfunctions too (though not always in that regard). That’s why we tend to carry an arsenal of useful items to take care of problems like ripped seams, tears, and other surprises that might pop up along the way. The humble office stapler, for example, is excellent for fixing cloth costumes, especially if you’re in a hurry. We’ve used it to bridge rips and tears before, and it bears up to scrutiny pretty well from a distance. Just be careful about using it on fabric with loose fibers, as those don’t staple all that well. You could also do the same with safety pins (we usually pack about a dozen), which are great for tacking down loose fabric, and keeping things like capes secure, and you definitely can’t ever go wrong with a spool of thread and a sewing needle. We keep thread in several colors (typically white, black and skin tones) in our kit bag, in case we develop any holes or runs in our base suits too. It’s funny if you think about it, but rations like an energy bar and bottled water aren’t exactly tools, right? But take it from us, we’ve discovered that even if your costume weathers the con well, fatigue and exhaustion can get to you if you’re on your feet all day, and that would mean you can’t give your all when you’re trying to portray that awesome character you’ve worked so hard for. It’s especially true since cosplayers (us included) tend to stay awake for hours on end, doing last minute touch-ups and repairs (or just struggling to finish that costume) just before a con. Getting a bite or two in, and some fluids in your system every now and then will definitely keep you on your feet, at least until the day’s done (just think of it as ‘repairing’ your body). How ’bout you, cosplay friends? Do you carry kit bags around to conventions too? What do you pack in them? We’d love to hear how that figures. See you at the con! Cheerio! If you liked this cosplay tutorial, and the many other guides and tutorials on our blog, please do vote for us in the Singapore Blog Awards! We’re dedicated to creating more quality cosplay and pop-culture related content, and your continued support will go a long way towards helping us realize this. 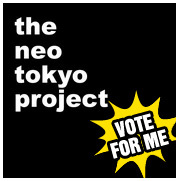 You can do so simply by clicking on the Vote icon, or on this link now.